Today while taking a break from writing some project related IP, I kicked over to my home lab rebuild that was pretty much stalled in lieu of the other things I have running around these days. 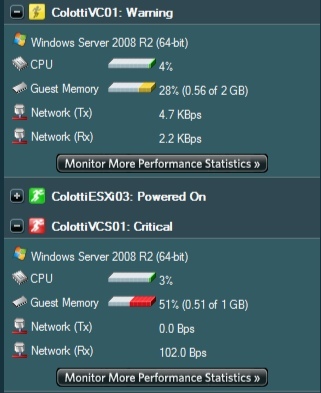 While I was waiting for some things to update I decided to take a look at one of the free tools the folks over at SolarWinds have called VM Monitor. Now I have always been a fan of both their free tools as well as some of their full versions. In the next month or so I may be kicking the tires on more of them just to see what they have these days. What you get is a really nice graphical view directly from your windows workstation of the real-time stats of the Virtual Machines on the host. This little guy is so easy to set up and get running you should give it a try if you have not yet. This tool has been out for a while, but is still pretty cool to use. I will be downloading some of their other tools as well to see how they work with vSphere and vCloud Director once the lab is re-built.